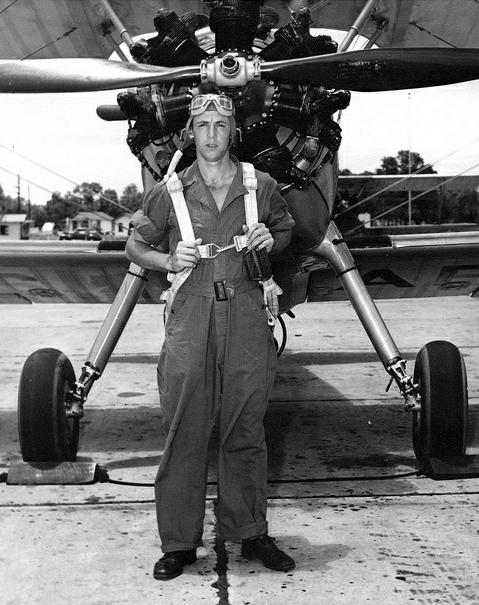 Leo Carlton during his pilot training (roughly 1943). In 1997, I lost my grandpa Carlton to leukemia. Since my aunts, uncles and grandma on my dad’s side keep telling me that I am his spitting image, I guess I have a special bond to him. In honor of tomorrow (June 3) being National Cancer Survivors Day, I wanted to write this post to honor him. It wasn’t until two years ago when I dove head first into a history project for my grandpa. He was a B-24 co-pilot based in Cerignola, Italy with the 459th Bomb Group. During his 10th mission, his plane was damaged near Munich, Germany, and they tried to land in Switzerland. However, a dummy runway setup by the Germans served it’s purpose and their plane, the Cherry II, landed on the wrong side of the border. He and his crew were taken POWs. His story is one that I am honored to have researched. His personality and attitude toward his very hard circumstances, I feel, are what got him through this fight with cancer. Thought he lost his war in the end, he fought numerous battles – won a few and lost a few. I write this post in honor of him, and all other cancer survivors. If you, or someone you know is a cancer survivor, click here and take a moment to honor all cancer survivors by writing your (or their) story. This Facebook app allows you to read the stories, share your own, and find hope. You won’t regret it. My name is Eric Jaeger from Austria. I’m living in the town of Hoechst where your grandfather had his emercency landing 1944. In the meantime I did a lot research of the B-24 bomber with the serial number 42-78106. Let me know if you have any questions. I’m looking for a picture of the crew of Cheery II.